Pierre Van Dormael (May 24th 1952 – September 3rd 2008) was a musician of many talents, and is considered by many a pioneer in various musical forms and experiments. Choir singer and chamber orchestra violinist as a child, then folk singer-guitarist, Pierre Van Dormael went on to study arranging and composition at the Berklee College of Music in Boston. In the 1970’s he played as a session guitarist on countless albums. In the 1980’s he became a hit-song writer as well as an avant-garde guitarist. He co-founded the “Kaai” jazz club where he created the group “Nasa Na” (1989-1992) that later became the well-known trio “Aka Moon”. From 1994 to 1997, he lived in Africa to continue his studies and research into “Rhythmic Harmony”. 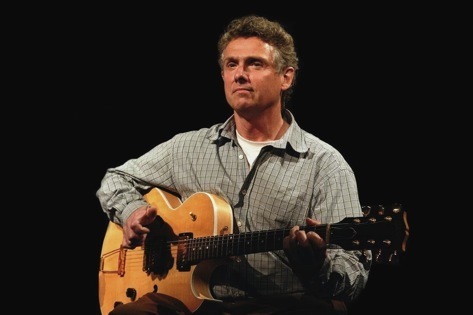 Talented guitarist and passionate improviser, musical theorist, composer and arranger, Van Dormael was also an influential teacher at various jazz schools such as Conservatoire de Namur, Jazz Studio Antwerpen, Conservatoire de Dakar (Sénégal), Koninklijk Conservatorium Antwerpen and Lemmensinstituut Leuven. He composed the original music scores for his brother Jaco Van Dormael’s films: “Toto le Héros” (1991), “Le Huitième Jour” (1996) and “Mr Nobody” (2009) for which he received the Magritte Award for Best Original Music Score. He also wrote the original score for the P.F. Martin-Laval film “Essaye-moi” (2006). His music has been recorded by such wonderful musicians as Frank Foster and Freddy Green with the Count Basie Orchestra, Steve Coleman, Aka Moon, Byard Lancaster, Deborah Brown, Toots Thielemans, Lizz Wright… and he performed in concert with Philip Catherine, Reggie Washington, Slide Hampton, Bill Frisell, Billy Hart, Bob Stewart, Soriba Kouyate, Greg Osby, David Gilmore, Prasanna, Marc Ducret, Magic Malik, Hervé Samb… and countless fellow musicians of the Belgian and international jazz scene. Throughout his career, Pierre Van Dormael created, composed and played in a great number of groups which were featured at numerous Jazz festivals and clubs around the world. His work has been recognized with the Belgian Django d’Or Award in the Established Musician category (2007). In his lifetime and beyond, Pierre Van Dormael has inspired countless musicians, young and old, in their search for musical discovery.